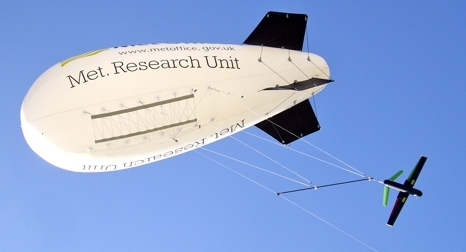 BALUGA One (Balloon- or Aircraft Launched Unmanned Glider for Atmospheric research One), our new, high altitude instrument platform underwent initial trials at the MetOffice Research Unit at Cardington. Conducted using a tethered balloon (operated by the MetOffice), the balloon attachment system, as well as the balloon release mechanism of the new ASTRA glider was tested. With a release weight of 2kg, BALUGA One is designed to be launched from a high altitude, free balloon. Fitted with a sophisticated autopilot, BALUGA One is capable of returning its payload package to the launch location (or some other pre-determined collection site). See the Documents and Publications section for more details on the glider.